A few weeks ago, I travelled down to the heart of London to BBC Broadcasting House where I attended the BBC's World Book Club to participate in an interview which was being recorded with David Mitchell, author of the best selling literary novel Cloud Atlas. 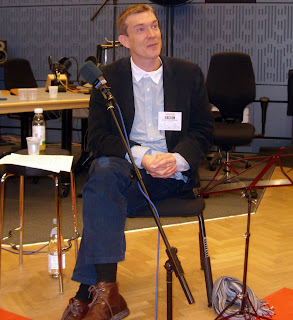 I spent a very enjoyable morning enjoying the hospitality of the BBC and listening to David talk about his fascinating and complex book. 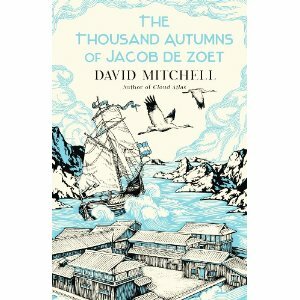 David's latest novel The Thousand Autumns of Jacob de Zoet has just been released this month in hard back. I highly recommend both books but if you'd like to find out in greater detail what I thought about both of these literary feasts then please pop over to the The View From Here and read my article The Thousand Autumns of David Mitchell. BBC Broadcasting House -with a van conveniently parked outside to ruin my shot. It always happens doesn't it? Just when you think you've got the perfect view some idiot (or small child) ruins it! The building looks small from this angle but it's rather like a tardis. Fortunately, I had an able BBC employee to show me around, otherwise I could have been lost for weeks. Oh, and by the way, BBC coffee isn't as bad as you think. David Mitchell answers questions on Cloud Atlas. David is a quietly spoken, modest man with a very affable personality. As you can imagine, being a literary giant, he is also highly articulate so the whole experience was very interesting and rewarding. 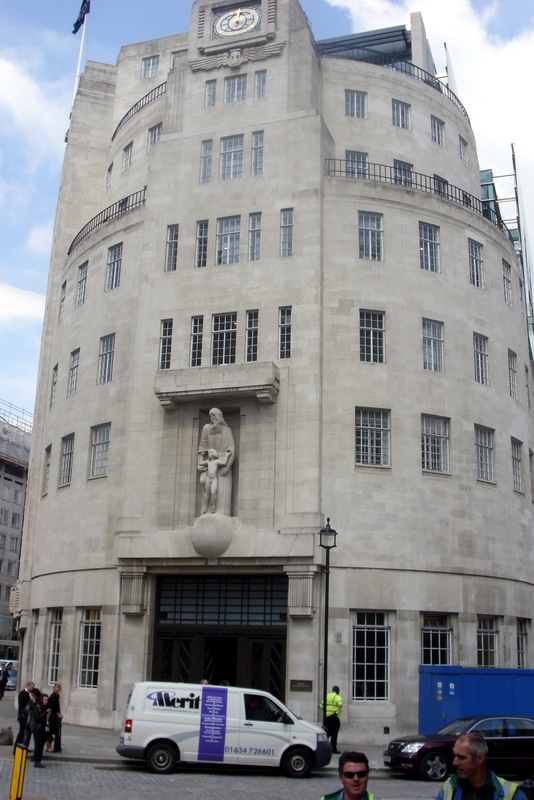 The show will be broadcast on June 5th so if you'd like to listen, check out when it be aired in your area on the World Service Book Club site. Broadcasting House is in the centre of the West End, so afterwards I took a stroll around the area. Above is Regent Street. Many years ago I worked for a prestigious shop located just along from the very famous Hamleys toy store so I walked this and nearby streets daily. This is a fairly quiet day. At Christmas the streets would be jostling with crowds and vendors selling roast chestnuts and imitation designer perfumes. The shop where I worked has now relocated further down Regent Street and whilst it is very sleek and modern it doesn't have an ounce of the character it had in my day when goods were displayed in wooden and glass cabinets, we sat at oak desks and customers revelled in our traditional ways. I was even more saddened to see that the wonderful Garrards, the crown jewellers, and where I did some of my training, has also relocated. I was once down at Garrards in a back room when one of the staff appeared and said "anyone lost these?" She'd found a £19,000 pair of earrings on the stairs! It was a very old fashioned but lovely place with a splendid flowing staircase perfect for those grand entrances; I always fancied doing a bit of a turn on them aka Ginger Rogers but never got up the courage. Pity! Lots of interesting people came and went at both shops and at the sister shop, where I worked, I remember an occasion where the security guard held the door open for a thief who was hiding a £15,000 sterling silver armoured tank under his coat! Ahhh... I miss those days.... such fun! 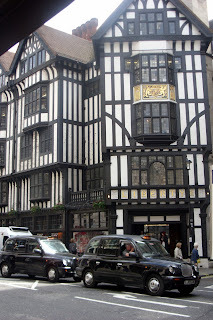 The stylish Libertys department store with its facade reminiscent of the Tudor period - you can just imagine what London might have looked and felt like back in the 1500s! Although, I guess, the streets of the 1500s were considerably more smelly.... you certainly wouldn't have wanted to walk around without a hat on your head. And, of course, pictured in this photo are the two of London's infamous black cabs - fantastic if you want to get somewhere on time. Or not. The London underground. Not at rush hour obviously. Otherwise I'd probably been splattered on the tracks whilst trying to find some elbow room to take a photo. Not a lot as changed; some new upholstery, some new posters, even the occasional electronically displayed poster. Other than that, it's still ghastly. 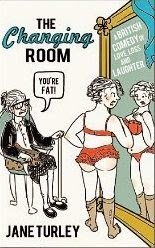 Some things you just don't miss! And just to finish; here's a book trailer for the wonderful The Thousand Autumns of Jacob de Zoet, which if you get a chance to buy, may I recommend the UK edition which has a superb cover which will, I'm sure, be treasured by many a bookaholic.